David Jeremiah Morning and Evening Devotions Holy Moments in the Presence of God By David Jeremiah is a new devotional book that is certain to address the spiritual needs and challenges you face day to day. Whether facing the daily day to day stresses of work and family to the tragic experiences and crisis of illness and death, the author provides spiritual strength for each day. This beautifully bound hardcover book is pocket sized; small enough to read while holding it in one hand whether you are reading in bed before sleep or carrying it in your purse. The two toned pages and embossed cover make this an inviting book to read or to give as a treasured gift. Each day has two devotions, side by side- one for morning and one for night. This devotional is versatile enough that you do not necessarily have to follow a structured 365 day a week daily reading plan. The passages are quick to read and easy to understand. Even those with busy life styles or those entrenched in grief will be able to find the time or muster up the strength to read a devotion each day. This devotional is general enough to be applicable to readers of all ages, as well as men and women. There are so many devotional books on the market. What makes this one special is that it is written by a spiritual authority- a well known Christian author and writer, who has proven to be guided by the Holy Spirit and is faithful to the bible. 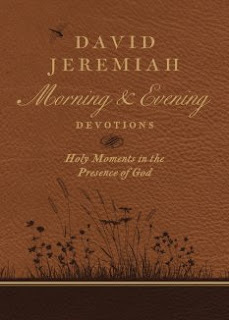 Anyone can say they have written a devotional book- but David Jeremiah writes with biblical authority and faithfulness. As a blogger for Booklook I received a copy of the book published by Thomas Nelson for the purpose of writing this review.